When it comes to big home improvements and renovations, we’re always for affordability and simplicity. We don’t want to waste thousands of dollars paying a contractor to put in a deck or update our kitchen. Especially when can do it ourselves. Thanks to the help of easy-to-do videos on YouTube, we can renovate our homes with our own skillset and we can do it all on a budget. At least, some of us can. Others, not so much. Here are 10 DIY home improvements that failed so bad we wish the homeowner called the contractor! We all experience those moments when we get so consumed by our work that we forget just what it is we’re doing. 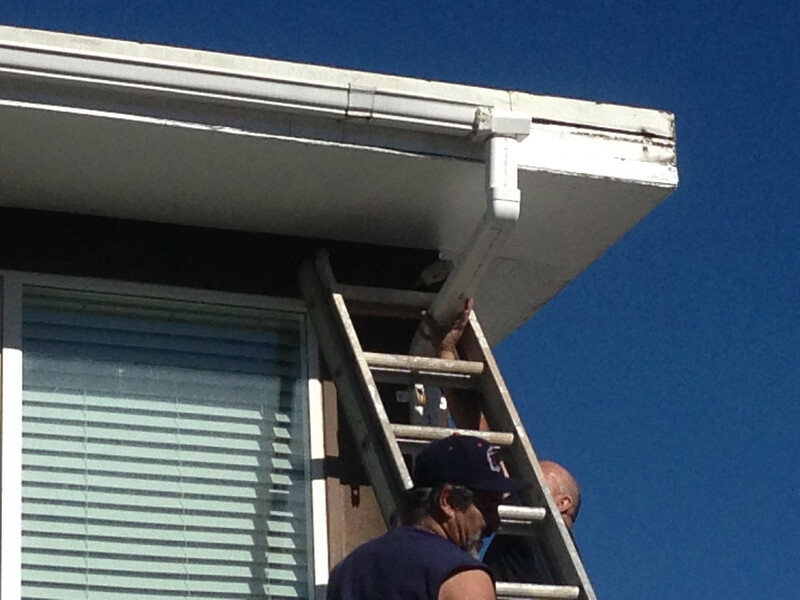 When this handyman installed his new gutters, he was clearly in the zone and forgot that he had a ladder. Guess he’ll just have to take the gutters out and start from scratch. Hopefully, he’ll be paying attention next time. Sprinklers usually go outside the house, not inside. This plumber must’ve thought the kitchen counters could use a good cleaning because that is one disastrous plumbing job. He clearly doesn't know what he was doing. This is a prime example of money not-well spent on a contractor. The woman was better off fixing the faucet herself, rather than hiring someone with no knowledge of the trade. Calling a professional can sometimes be a tricky task. You never know what you're going to get. 8 Two Light Switches Equal One Big Fiasco! We’re pretty sure Home Depot sells double-switch lights. Plus, they’re sold together for one price, so there’s no need to get an extra one. We’re not sure what HGTV show or YouTube video this homeowner was watching, but clearly, they weren’t paying attention. We can’t even imagine how the wiring work must look. are the switches even functional? Huge trees are a nuisance to any homeowner. They take up space and shed too many leaves on the ground in the fall. It’s ten times worse when we have a big rotting tree in our front yard that’s ten seconds away from crashing down on our house. Yet this tree doesn’t appear to be rotting or bothering the homeowners for that matter. It seems as if they deliberately put the tree there as an odd decorative piece for the driveway. We’re wondering where they park their cars? Chalkboard paint has made life easier and simpler for homeowners. It can be used on any surface and allows one to create their designs. A trend among trends, a refrigerator chalkboard is one of the top DIY home projects for the average homeowner. 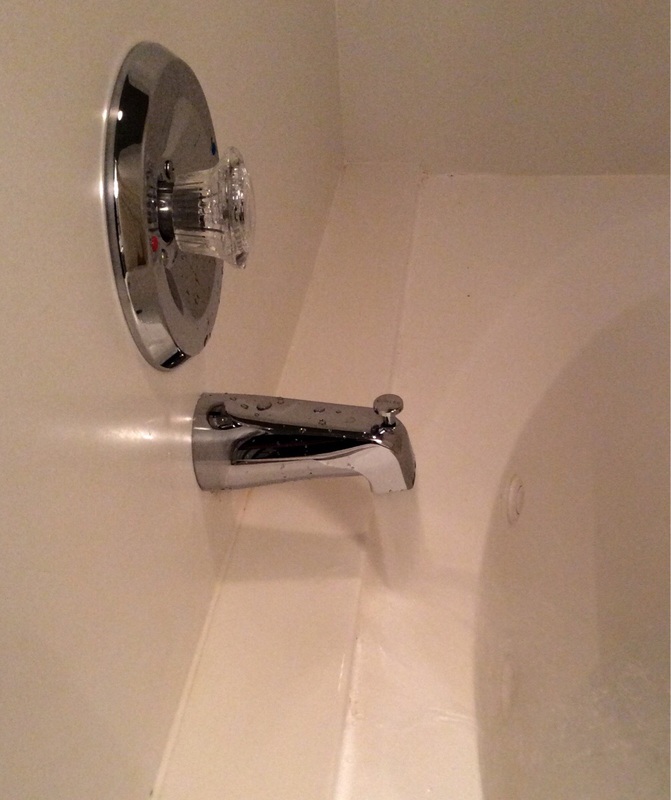 Unfortunately, this homeowner’s DIY improvement looks like a job not well done. Either the paint is chipping off the fridge’s door handle or they missed a spot. Actually a few spots. It might’ve been a good idea to read the instructions first on how to apply chalkboard paint onto household surfaces. The photo of this falling deck reminds us a lot of the childhood rhyme “London Bridge Is Falling Down”. Maybe if the homeowner added in a few more screws or plaster, the deck wouldn’t have dipped over on one side. They might want to fix it fast because by the looks of this photo it’s about to rain. 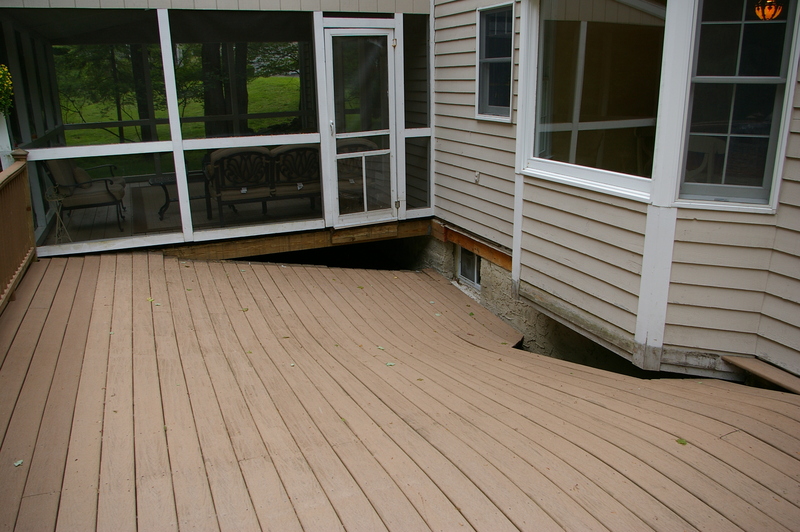 Nothing say’s a failed deck job like water damage to a perfectly good house. It’s okay that some of us weren’t good at math in school. Not everyone can be an arithmetic whiz. When it comes to renovating your kitchen, however, there’s no excuse. Apparently, this homeowner forgot to take down measurements for his cabinets and placed them just a little too close together. Now every time he opens them, they run into each other like bumper cars. Better luck next time. Getting a new couch, whether we rent one or buy it, can be costly. Though the benefit of buying a new piece of furniture is that you don’t have to struggle with maintaining your old one. This couch must have been a family favorite in this homeowner’s house because they clearly weren’t willing to give it up. Some things just can’t be salvaged, even with the help of elastic duck-tape. The least they could’ve done was buy tape that matched the color of the couch. Just get a new couch, for the sake of the living room, and our poor eyeballs. 2 Hot Tub Epic Fail! When making improvements to our homes, the first objective should always be to remove or cover items we don’t want ruined. This can include covering our furniture with old bed sheets when repainting our living room or covering the kitchen countertops when redoing our cabinets. Taking down the upstairs deck without first uninstalling the hot tub is just pure laziness. 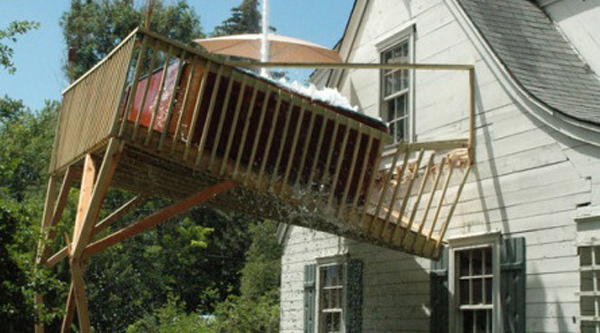 If we’d seen the actual video of the destruction of this deck, we’re pretty sure we’d see some part of that tub crashing into the side of the house. More problems, more money. A few more inches and this DIY homeowner would’ve been golden. Unfortunately, the lack of precision here is going to be costly to redo and fix. We can only imagine what the reconfiguration of the plumbing might cost. Our advice, stick to what you know and avoid epic fails like this. It’s really not worth it.